Mom and Dad both had many open doors to teach others. Here Dad is teaching Chemistry to the High School boys in the school where Jeremiah volunteers. Dad spent several evenings teaching classes to the students from Buea College of Biblical Studies. We heard a lot of good feedback from the students and teachers about Dad's lessons. Dad teaching a Sunday School class in the village of Mile 16. Group Picture with a few of the Saints at Mile 16. We got to celebrate Hannah and Jonathan's birthdays again while Grandma and Grandpa were here. They brought party stuff with them, paper plates (Jonathan's favorite color is red), Happy Birthday banner, cake mix, etc. The kids loved having their grandparents here. Jeremiah using our homemade grill for the first time to prepare dinner for our guests in the evening. Hannah is always happy to help! The Omams were our special guests from the Buea Church of Christ. They have been very welcoming since we've arrived and met them in Cameroon. It was nice for my parents to meet some of the Cameroonians we have been working with. Dad preaching at the Buea Church of Christ. Mom was able to help minister to many women while here, some one on one and some in groups. Here she is having Bible discussins with a Catholic lady named Kate. I had the ladies from our gym come for a class about diabetes and high blood pressure led by Mom who is an RN. She also encouraged us ladies with Romans 8:12-14. God promises Christians that he will help us overcome the deeds of the flesh. We hosted the ladies all night prayer meeting while my parents were here. Mom was given the opprotunty to share with the ladies from the church here in Buea. It was a really nice time full of singing, praying, and lessons from a few ladies. Mom was a trooper as she stayed up with the rest of the ladies while pregnant Brittney went to sleep earlier (around midnight). We have a monthly young ladies meeting I lead with one of the older ladies in the Church. Mom was here when this took place and encouraged the young ladies with the Scriptures and we also talked about this year's Spiritual goals they have. Hannah, Mom and I had a nice afternoon tea party. Hannah used us to practice leading Bible studies. She is quite an amazing little girl- with an amazing grandma to look up to. Dad also got to lead a marriage class using Scriptures from the book of Ephesians. My parents have a great marriage and truly set an example of the relationship between Christ and the Church. What a blessing it is to have them as parents and fellow Saints whom we can imitate. It was indeed a great visit, very encouraging and thought provoking and really a blessing. We thank God for their faith to come and pray that He continues to strengthen them in this great service. 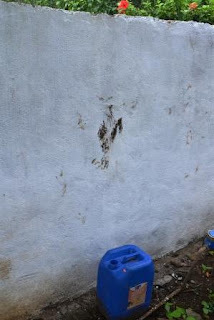 On the night of the 13th of April, while we slept soundly, someone drugged our dogs to make them drowsy, then jumped over this wall to come and steal our laptop. They also rummaged through our vehicle but only stole a few minor things. They got mud on the wall when they left. The laptop was in our office on the desk. The thief had obviously been in our house and yard before (we suspect the plumber, but can't prove anything) because they knew that the laptop would fit through the diagonal space between the bars. They tore the net and dragged it out with some sticks. When we woke up in the morning- the wires were dangling out the window, but our laptop was gone. The hardest thing was losing most of our pictures since December, including all the pictures of our time in Ghana, along with Jeremiah's lessons and notes since then. We are glad that we had backed everything up in November, so not everything is lost, but it still hurts. Pray for us to have peace, and for our security. We will be trying to reinforce these windows and seeing what else we can do for security. While we lost something dear and precious, the generosity of you all, our brothers and sisters in Christ, dear readers, encouragers and supporters, blessed us with two big gifts- here is our new Generator! This will help our security, as thieves often come when there is a prolonged power outage- this will run some lights around the house. It also keeps stuff in the fridge from spoiling, and we hope to be able to use it in the future for village evangelism projects. Thank you! Another BIG blessing, in many ways is this new water tank that we were able to get! It holds 2000 Litres, or around 600 Gallons! Thank you so much for helping make this possible. Our water supply has been very very poor, as many of you know... we hope to have this mounted up by the weekend, and then just have to pray for the water to come on (off since Thursday) so that it can fill up! Good times and bad times come- but in everything we give thanks as I Thessalonians encourages us. Thieves and robbers may try and discourage and frustrate, but you, our dear family, are used by God to be huge encouragements and to help us keep on serving the Lord! Thank you! Our next blog post will be about Brittney's parents wonderful visit! We are so thankful for the congregations and individuals who have sent letters and packages to us. Here are just a few ways of how some of the items have been a blessing to the ministry! Here is a Sunday school class using construction paper, markers, stamps and stickers that were sent by a beautiful lady with a big heart. The kids had so much fun every step of making their craft. The stickers they used said, "FROG." Fully Rely On God! Here is the Sunday school class room for the kids. The kids finished art work. Us teachers had just as much fun helping as the kids did it. Strong pencils are another item that was sent. You can get pencils here but they are cheap pencils of bad quality that break easily. It is especially nice to use good strong pencils as Hannah is learning to write cursive. One of the many items that were sent by the Fulton Church of Christ is water paint! Our neighborhood kids really enjoyed painting for the first time. Some of the kids we work with would never have the chance to do such projects if it weren't for the thoughtfulness of those in the States. We want to say a special THANK YOU to all who have been so generous, thoughtful and encouraging by sending packages, finances, praying, etc for the ministry. I hope it encourages you to see just a few of the many ways you have blessed the work here. We pray that God will continue to bless you with spiritual blessings as you continue to serve Him!